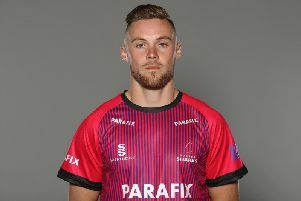 Liam O'Brien smashed 179 from 111 balls as Preston Nomads' 2nd XI totalled 424-2 in their win against Eastbourne 2nd XI in Division 3 East of the Susssex Cricket League. In the Premier Division, last year’s champions East Grinstead started with a win as they beat Horsham by 72 runs. Leo Cammish hit an unbeaten 108 and skipper Will Adkin 84 as EG scored 233-5. Mika Ekstrom took 2-40 for Horsham.In reply, Sussex’s Tom Haines hit 89 and Ian Sturmer took 4-42 as Horsham ended on 161-9. Promoted Ifield lost there first Premier Division game despite bowling Hastings and St Leonards Priory out for 145. James Pearce (4-48) and Mahad Ahmed (2-15) were the pick of the bowlers while Greg Devlin (28) was top scorer for Hastings. In reply John Morgan (4-16), Jed O’Brien (2-23) and Josh Beeslee (2-18) helped bowl Ifield out for 102. Mike Norris top-scored with 25 for Ifield. Brighton and Hove (241 all out) enjoyed a comfortable 57 run win against Cuckfield (181 all out). Waheed Safi (69) and Isaac Taylor (50) starred for Brighton, while Greg Wisdom took 4-2 for Cuckfield. In reply, Stan Harrison took 4-28 for Brighton, who had former Sussex star Matt Machan in their line-up. Roffey (281-7) hammered Middleton (117 all out) by 164 runs. Theo Rivers (65), Ben Manenti (60), J Khan (55) and Leigh Harrison (5-19) were the stars of the show for Roffey. Promoted Eastbourne (178 all out) lost their first game back the Premier Divison to Preston Nomads (180-6). In Division 2, Ansty (165-9) lost a tight match with St James's Montefiore (172-7). St James’ Henry Sims top-scored in the match with 77. Promoted Chichester Priory Park (197-7) enjoyed a 47-run win over Lindfield (150-10) while the other promoted side Haywards Heath (248-10) also won, beating Bognor Regis (183-10) by 65 runs. Jonny Phelps (60), Callum Smith (55) and Steve Goulds (52) hekped Heath to their title before Smith claimed 5-18. Joel Baker hit 74 for Bognor. Mayfield (227-9) beat Bexhill (156-9) thanks to 66 from Jason Finch and 5-25 from Will Sheffield while Three Bridges (147-10) lost to Billingshurst (194-10). Tom Haynes (87) and Andy Barr (4-29) starred for Hurst. Division 3 West: Findon 1st XI (85-5) beat Three Bridges 2nd XI (83 all out); Roffey 2nd XI (122-2) beat West Chiltington & Thakeham 1st XI (119 all out); Steyning 1st XI (138-8) lost to Goring By Sea 1st XI (140-1); Stirlands 1st XI (122-4) beat Slinfold 1st XI (121 all out); Worthing 1st XI (144 all out) lost to Pagham 1st XI (145-7). Highlights: Chris Webb hit 84 not out off 72 balls for Roffey 2nd XI. Rico Webb hit a 27-ball 56 for Pagham. Division 3 East: Bexhill 2nd XI (43-10) lost to Crawley Eagles 1st XI (44-1); Brighton & Hove 2nd XI (138-10) lost to Seaford 1st XI (234-8); Burgess Hill 1st XI (169-7) beat East Grinstead 2nd XI (123 all out); Eastbourne 2nd XI (192 all out) lost to Preston Nomads 2nd XI (424-2). Highlights: Liam O’Brien hit 179 from 111 balls and Taron Ikram 99 from 82 balls for Nomads. Rilwan Mohamed took 8-10 for Crawley Eagles.